The gallery is situated on Millbank, on the site of the former Millbank Prison. 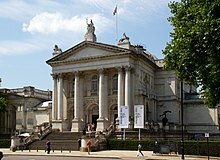 Construction, undertaken by Higgs and Hill, commenced in 1893, and the gallery opened on 21 July 1897 as the National Gallery of British Art. However, from the start it was commonly known as the Tate Gallery, after its founder Sir Henry Tate, and in 1932 it officially adopted that name. Before 2000, the gallery housed and displayed both British and modern collections, but the launch of Tate Modern saw Tate's modern collections move there, while the old Millbank gallery became dedicated to the display of historical and contemporary British art. As a consequence, it was renamed Tate Britain in March 2000. The front part of the building was designed by Sidney R. J. Smith with a classical portico and dome behind, and the central sculpture gallery was designed by John Russell Pope. Tate Britain includes the Clore Gallery of 1987, designed by James Stirling, which houses work by J. M. W. Turner. The Clore Gallery has been regarded as an important example of Postmodern architecture, especially in the use of contextual irony: each section of the external facade quotes liberally from the building next to it in regard to materials and detailing. Crises during its existence include flood damage to work from the River Thames, and bomb damage during World War II. However, most of the collection was in safe storage elsewhere during the war, and a large Stanley Spencer painting, deemed too big to move, had a protective brick wall built in front of it. In 1970, the building was given Grade II* listed status. In 2012, Tate Britain announced that it had raised the £45 million required to complete a major renovation, largely thanks to a £4.9 million grant from the Heritage Lottery Fund and £1 million given by Tate Members. The museum stayed open throughout the three phases of renovation. Completed in 2013, the newly designed sections were conceived by the architects Caruso St John and included a total of nine new galleries, with reinforced flooring to accommodate heavy sculptures. A second part was unveiled later that year, the centrepiece being the reopening of the building's Thames-facing entrance as well as a new spiral staircase beneath its rotunda. The circular balcony of the rotunda's domed atrium, closed to visitors since the 1920s, was reopened. The gallery also now has a dedicated schools' entrance and reception beneath its entrance steps on Millbank and a new archive gallery for the presentation of temporary displays. The front entrance is accessible by steps. A side entrance at a lower level has a ramp for wheelchair access. The gallery provides a restaurant and a café, as well as a Friends room, open only to members of the Tate. This membership is open to the public on payment of an annual subscription. As well as administration offices the building complex houses the Prints and Drawings Rooms (in the Clore galleries), as well as the Library and Archive in the Hyman Kreitman Reading Rooms. The restaurant features a mural by Rex Whistler. Tate Britain and Tate Modern are now connected by a high speed boat along the River Thames, which runs from Millbank Millennium Pier immediately outside Tate Britain. The boat is decorated with spots, based on paintings of similar appearance by Damien Hirst. The lighting artwork incorporated in the pier's structure is by Angela Bulloch. The main display spaces show the permanent collection of historic British art, as well as contemporary work. It has rooms dedicated to works by one artist, such as: Tracey Emin, John Latham, Douglas Gordon, Sam Taylor-Wood, Tacita Dean, Marcus Gheeraerts II, though these, like the rest of the collection, are subject to rotation. The gallery also organises career retrospectives of British artists and temporary major exhibitions of British Art. Every three years the gallery stages a Triennial exhibition in which a guest curator provides an overview of contemporary British Art. The 2003 Tate Triennial was called Days Like These. Art Now is a small changing show of a contemporary artist's work in a dedicated room. Tate Britain is the home of the annual and usually controversial Turner Prize exhibition, featuring four artists selected by a jury chaired by the director of Tate Britain. This is spread out over the year with the four nominees announced in May, the show of their work opened in October and the prize itself given in December. Each stage of the prize generates media coverage, and there have also been a number of demonstrations against the prize, notably since 2000 an annual picket by Stuckist artists. In recent years the exhibition and award ceremony have taken place at locations other than in Tate Britain: for example in Liverpool (2007), Derry-Londonderry (2013), Glasgow (2015) and Hull (2017). Tate Britain has attempted to reach out to a different and younger audience with Late at Tate Britain on the first Friday of every month, with half-price admission to exhibitions, live music and performance art. Other public involvement has included the display of visitors', as opposed to curators', interpretation of certain artworks. Regular free tours operate on the hour, and at 1.15 pm on Tuesday, Wednesday and Thursday short 15-minute talks are given on paintings, artists and artistic styles. When the Pre-Raphaelite painter and President of the Royal Academy, John Everett Millais, died in 1896, the Prince of Wales (later to become King Edward VII) chaired a memorial committee, which commissioned a statue of the artist. This was installed at the front of the gallery in the garden on the east side in 1905. On 23 November that year, The Pall Mall Gazette called it "a breezy statue, representing the man in the characteristic attitude in which we all knew him". In 1953, Tate Director, Sir Norman Reid, attempted to have it replaced by Rodin's John the Baptist, and in 1962 again proposed its removal, calling its presence "positively harmful". His efforts were frustrated by the statue's owner, the Ministry of Works. Ownership was transferred from the Ministry to English Heritage in 1996, and by them in turn to the Tate. In 2000 the statue was removed to the rear of the building. ^ Press Release: New Director of Tate Britain Appointed, Tate online, 29 July 2015. Retrieved 14 July 2016. ^ 'General introduction', Survey of London: volume 26: Lambeth: Southern area (1956), pp. 1–17. Date accessed: 27 March 2010. ^ "British Architecture", Architectural Design, London, 1982, p.78. ^ Historic England. "Tate Gallery (1222913)". National Heritage List for England. Retrieved 31 August 2016. ^ a b Sulcas, Roslyn (18 November 2013). "Tate Britain Completes Renovation". New York Times. Retrieved 19 November 2013. ^ "Tate Britain hits £45m renovation target". BBC News. 17 May 2012. Retrieved 19 November 2013. ^ a b Merrick, Jay (18 November 2013). "Tate Britain's redesign: It may not be cool but it's restrained, and elegant, and it works". The Independent. Retrieved 19 November 2013. ^ "'Transformed' Tate Britain unveiled". BBC News. 18 November 2013. Retrieved 19 November 2013. ^ "Prints and Drawings Rooms". Tate. Retrieved 15 August 2010. ^ "Research services: library", Tate online. ^ "Research services:archive", Tate online. ^ "Research services: Hyman Kreitman Reading Rooms", Tate online. ^ "Millbank Pier web site". Millbankpier.co.uk. 22 May 2003. Retrieved 15 August 2010. ^ "Days Like These", Tate online. ^ "events education", Tate online. ^ Tate Britain Archived 9 February 2012 at the Wayback Machine, LondonBoard.co.uk, Accessed 8 February 2012. ^ a b c d Birchall, Heather. "Sir Thomas Brock 1847–1922", Tate online, February 2002. Retrieved 5 April 2008. ^ "Walking directions to '''Tate Britain''' from '''Pimlico tube station'''". Maps.google.co.uk. 1 January 1970. Retrieved 15 August 2010. ^ "Walking directions to '''Tate Britain''' from '''Vauxhall station'''". Maps.google.co.uk. Retrieved 15 August 2010. ^ "Walking directions to '''Tate Britain''' from '''Millbank Millenium Pier'''". Maps.google.co.uk. Retrieved 8 April 2011.